Cabbage Brewery is coming together really well. I do like the underlying humour and the way the buildings have been altered. The hopper unloading pit is an idea I may well pinch for Paseo Docks - I've been wondering how to make it look as if Hoppers can be unloaded, without having to make a hole in the baseboard. Thanks for liking the idea. Although I have entered Cabbage Breweryin the competition I have still a few bits I want to finish. I need to add a small wood store for the cooperage by the Dray Shed. I think I might build a larger station board with a few more building & stock. I want to do the Dragon Dung Hopper & Salt Van. At the weekend a pick up a built white metal ex LMS 3 axle van which appears nearer HOto become the Cabbage Light Railway Road Van. Think it might be a old K kit. is at a higher level. So the fuel drop section overhung the area, I cut a few middle sleepers ties out. The under floor base is a Willis cobble wall sheet, with the ramped area from a side of ballest meant for a base of a plastic loco. The drops are a mixture of coffee stores for the long sections & match sticks for uprights including the crude buffer stops just 2 stick up above wagon height. Giles you could model the drops by cutting the sleepers away having a black or perhaps shaded dark grey area to suggest the pit area or even painted sloping walls. Then above track level use the coffee stirs ideas to suggest the wood work above the pit or it could be cast concrete section. All good ideas, Ian. I'm still mulling over the design for the ore bins. I suspect that to prevent flying dust,and stop people falling into the chutes, that the unloading pits will be partly under a covering structure. This also helps to thicken up a very low relief structure. Other thoughts are an over-track gallery housing a control room/office. I've working out if I have enough bits to another Cakebox as it Part 2 has started with idea of New Beginnings. I'm doing a idea based on The Simpsons using the Monorail idea. So calling it Springfield Monorail. I have already built a Moe's Tavern, I have got a 28mm Gas Station Kit which will make the Monorail Station with Dapol Footbridge stairs & a Monorail which will be a kitbash from a die-cast High Speed train body & Windows from a large scale coach body. Hopefully a little simpler than either Hawkins or Cabbage. Not sure what the 2nd popular culture reference will be in this one. As I've had Dr Who, Stranger Things, Discworld, Dad's Army cross over now The Simpsons. Will need to be something I can fit in with 1990's North America idea. 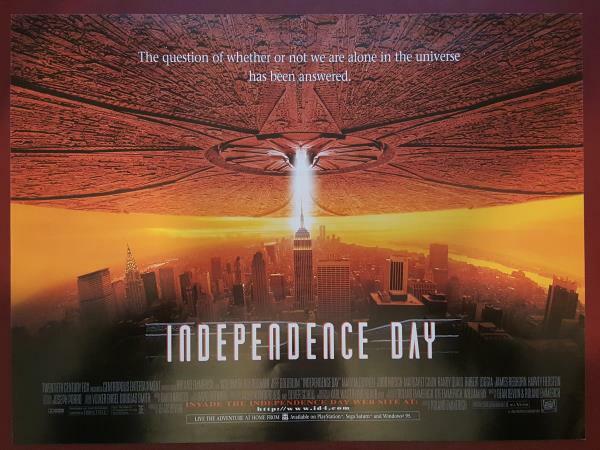 Independence Day as released in '96. How about a huge flying saucer suspended above with a bright LED shining down to light up the scenery?